As spring fever begins to subside, rivers and lakes begin to warm. The northern rivers and lakes begin to open up after a long winter of being sealed up from the world by ice. In the Midwest, The world of the channel catfish begins to take hold for another year and come to life. 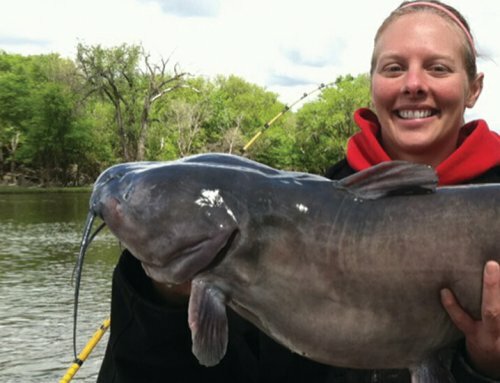 Catfish anglers come out from their own hibernation of sorts and head down to the riverbank or lake shoreline in search of those first channel cats of spring. For me, this time of year is heaven. A time to get out from a long northern winter and see what the river has to offer in the new year, a time to test out new gear and new ideas from months of refection and dreaming. I love the springtime bite more than any other simply because I find this to be one of the easiest times of year to catch catfish. There are a few wrinkles that make their way into the fold sometimes whether it is a late spring cold front, spring flooding, or a lack of spring flow. With whatever hand you are dealt channel cats are there and willing to bite. Most people who catfish know that as the spring water warms up so do the fish, but do most people understand why? The why is really quite simple, fish are cold blooded and catfish are a warm water fish. This means that the catfish prefers warm water conditions so moving from cold water to warm water increase the food requirements to live for a catfish and hence increases their need to feed to stay alive. When the water temperature is less than 40 degrees a channel catfish only requires one to two percent of his body weight one time per week to survive. Putting that in perspective a two-pound channel cat only needs to eat about a half ounce of food one time per week (about a fathead minnow). When water temperatures exceed 70, metabolism will rise exponentially as water temperatures rise eventually reaching the need to eat up to six percent of body weight per day to survive and grow. If you were keeping score that same two-pound channel cat would need to eat roughly two ounces per day rather than a half ounce per week. That is roughly 28 times more food required to live and grow with just a 30-degree variance in water temperature. This need to feed is a big part of why catfishing gets better and better as spring progresses. With this in mind during the early part of the catfish season (April thru June) the catfish will eat 30 to 40 percent of their yearly-required food. Considering northern channel cats don’t feed often during the winter months this is almost half of the years feeding in about a quarter of the year. This is a lot of feeding needs to be done in a short time, which provides a great advantage to anglers. 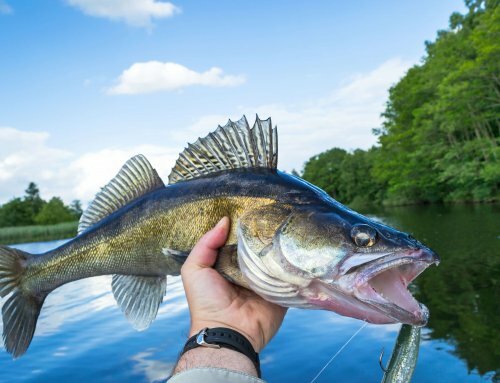 It is widely known that in the springtime catfish being the opportunistic feeders that they are will scour the shallows feeding on dead fish and other critters that have died during the long winter. In areas where the rivers and lakes freeze up for long periods of time and some winter kill occurs this will be more prevalent in areas where everything stays open for the majority of winter. Catching these cold-water catfish can have sort of an art to it. In normal years the best way to locate fishing areas is to look for snag piles or shallow areas where these dead and decaying morsels of food wash up. Some of the best spots like this would be where there is direct sunlight to warm the water a bit during the afternoon sun. Just this tiny increase in metabolism can spur a feeding frenzy. There are a few baits that work well in this situation. Many people say they like manufactured (stink) baits, but there are also many options for natural baits. First is walking the shoreline picking up dead and decaying fish from the winter kill. While this is a horrible process to collect and get on the hook what you are ultimately doing is matching the natural food to the water at its finest. Second, is making your own sour bait. This is when you take fresh fish, put it in a jar with some water and either set it in the sun for a couple days or bury it for a week or two and let the “natural juices” sour up. Third and my favorite, pulling the bait left over in the freezer from the previous year. It is a little freezer burned and not in the best shape after months but the fish seem believe it is much like what they have been eating. I have had a personal awakening so to speak with the frozen bait. On spring our first outing for catfish was a spur of the moment ordeal and none of the bait shops were open yet. I just grabbed a couple old bags of suckers from the freezer and we took off. As those fish thawed a vial odor overtook the boat but it was all we had. We caught fish after fish that day. We decided that fishing was good so we planned another outing for the next day. This time with the thought of we will get some fresh bait and we should really have fun. Long story short we did not catch a fish until I pulled out another bag of nasty left over from the day before and the action heated up again. As the spring progresses and the water temperature climbs into the high 40s and 50s the pre-spawn bite starts to increase in a big way. Thinking back to metabolism of a channel catfish the metabolism and food requirement needs increase by as much as 100 percent between 40 and 50 degrees. It is this increase in the need to feed that puts catfish in high gear. During this time the cats start to feed more aggressively. Also during this time the catfish will begin to prefer fresh bait as the dead fish and bait will be eaten up or deteriorated beyond consumption. Pre-spawn is a time when the catfish tend to feed aggressively feeding along break lines and running current seams. This is an easy pattern to get on because these seams are in all rivers. It is the point where the main channel meets the edge, which extends to the shoreline. In high water this may also be where the traditional shoreline meets with the new high water situation creating a secondary current. For the best success you want to place your bait just off the deep side of this break line and walk it back into the break. This is the area of least resistance and the catfish use it as a highway for traveling between holes, snags or any other structure where they might hold up for a rest. This is a situation when I like to use the straight-line method of catfishing. Straight lining does not work all the time but in some pre-spawn situations it can be effective. What you do is set up the anchor of the boat on the high side of a break line. You then cast short casts to the deep side of the break walking it back to the tunnel. With each line you send out a longer cast until you have all your baits in the strike zone straight down the break line. When a fish hits it will almost always run to the heavier current and out of the way of the other lines. All you do is simply shift the other lines to the back of the boat and reel in the fish. When recasting make sure you remember what place in the order it is or the next catfish may spell some untangling. 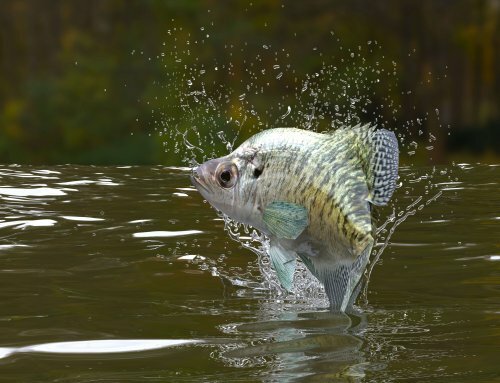 Before the water temperature reaches 60 degrees areas receiving the most sun during the day can be advantageous to catching these pre-spawn fish. These areas like in the earlier part of spring can warm up just a degree or two and increase the metabolism just enough to spur that feeding frenzy. 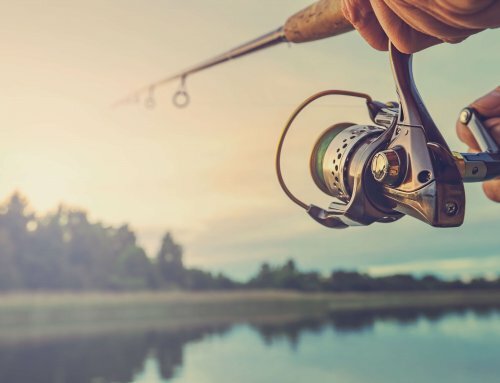 While fishing the areas where the sun warms the most is a good bet sometimes when the water is extremely clear it may push the fish to deeper, darker reaches of the current seams or into shady areas near snags. From the time the water temperature is 60 to the time it edges in on 70 and the spawn begins the channel cats are in high gear feeding and getting ready for the nearing spawn. Most areas of current are now rolling. Fishing can be easy sometimes during this period. However the fish will often turn and make a move downstream to begin finding nesting spots. When this happens there are two options to stay on fish. Option one is to keep fishing aggressively targeting the cats that are not yet ready to spawn. Option two is to slow down your presentation by fishing deeper cut banks near slack water areas and fishing snags near the slower water. There is one potential hang up that can slow down a pre-spawn bite. A spring cold front, usually in the form of a few cold days matched with rain can cool the water by a few degrees fairly quickly. When this happens the bite will decrease just as fast as it picked up with the rising temperatures. This is not the end of the world. The fish don’t quit feeding they just slow down. The quickest solution to solve this issue is to slow down your presentation and move laterally from your fast water area to a secondary current seam that is not moving as fast. It may also be a good idea to use structure such as snags, rocks, or sandbars more. This quick drop in metabolism will force the fish into an almost shock. This is the time you have to go to them rather than them coming to you. 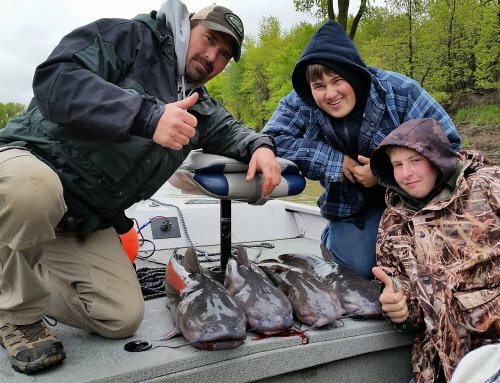 Spring is a time of excitement in the channel catfish world. It is exciting because it begins right after the long winter and because it almost seems that the catfish are as excited to bite, as we are to catch them. All of the advantages present themselves during this time. The catfish are waking up from the winter, their natural metabolism is coming to life with every degree the water temperature rises and the natural need to feed and procreate is in full swing during this time.